How can you get your resume to stand out from the competition? Online resume submission has made it much easier for candidates to apply for jobs than it was in the past. Unfortunately for job seekers, it has also increased the number of applicants for most positions. Catching the eye of the typical recruiter who is wading through scores of resumes can be quite challenging. Here's how to make it more likely that your resume will get noticed. When describing your previous employment experiences, emphasize how you solved problems and added value to the company. Begin phrases with keywords like "increased," "initiated," "resolved," and "improved"; these power verbs go beyond simply stating your duties to emphasize how you produced results. Numbers jump off the resume page. Identify the bottom line for your department. Is it sales volume, profit margin, donations generated, savings on expenses, expanding memberships, grants secured, or something else? Figure out the rough baseline level of activity before you arrived at the company and calculate the difference that you or your team has made. For example, you can include phrases such as "Developed PR initiative to increase the number of donors by X%" or "Implemented Fiscal Plan that Reduced Expenses by 10%." Also consider incorporating numbers to show how many staff, how large a budget, or how many customers you are responsible for. These numbers will help demonstrate the weight of your responsibilities. Note: although you should use a simple, conservative font for your resume and avoid the use of excessive underlining or italics, it can be very effective to boldface your quantifiable numbers and/or percentages so that they “pop” on the page. Demonstrating that others value your contributions often has a greater influence than you tooting your own horn. Include a category heading for honors/awards if you can fill it with formal recognitions. In your descriptions of the awards, use keywords that imply recognition, like "selected," "elected," and "recognized." Quality recommendations are another form of recognition. Beef up your recommendations on LinkedIn and be sure to include a link to your profile on your resume. If an employer asks for written recommendations, select recommenders who know your skills and accomplishments well. Most organizations value leadership and teamwork very highly. When writing descriptions of your previous jobs, try to include examples of how each job required you to demonstrate these skills. 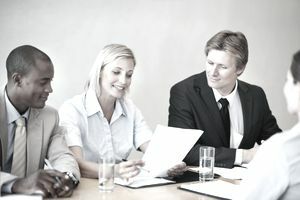 Incorporate words that show formal and informal leadership and teamwork, such as "led," "mentored," "drew consensus," "collaborated," and "sought input." Emphasize skills, accomplishments, and responsibilities which are most related to the requirements of your target job. To do this, find keywords in the job posting and incorporate them into your resume. You can also consider including a summary at the top of your resume that makes reference to the most relevant skills, accomplishments, and other qualifications. Including a resume title is another excellent way to get your resume noticed. The use of keyword phrases in vital in getting your online resume application reviewed because many companies utilize applicant tracking systems (ATS) to sort and “rate” the scores of job applications they receive. These systems are programmed to identify and rank certain keywords (typically, the ones utilized in the job descriptions). Thus, you should utilize as many keywords as possible throughout the text of your resume and cover letter. A good way of incorporating these words is to use a bulleted “Core Competencies” section in the initial qualifications summary of your resume that utilizes these keywords. Detail-oriented Accountant leveraging 7 years’ experience in corporate accounting to ensure on-time preparation and review of key financials. If you decide to include a core competencies section, this needs to be formatted either with a table or with bullets; text boxes and columns do not transfer well into online application systems, and may destroy the text formatting of your resume in transit, making it either garbled or illegible. Include a category for training, certifications, publications/presentations, and/or professional development. Emphasize any leadership roles with professional groups and any publications or presentations. As mentioned above, use boldface font for words that draw the eye to key accomplishments or recognition. Make sure important information is situated towards the top of your resume or in the beginning of your descriptions, so it isn't overlooked.